Albergue Juvenil Colegio Mayor Galileo Galilei i Valencia, Spanien : Boka nu! The youth hostel dormitory is located in the heart of the city university within the Campus of the Polytechnic University of Valencia, opposite the University of Valencia, next to the sports facilities of both universities. 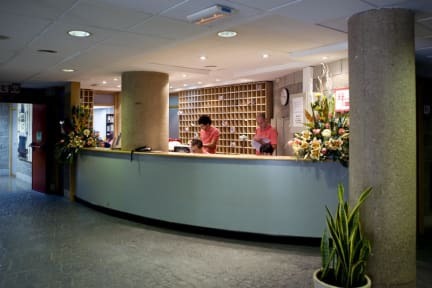 This hall of residence is open to the university community during the whole year. That includes students, teachers, investigators, administrative personnel, etc. In case of not being part of the education or university community, to provide the REAJ youth hostel card or any other certificate validated by that association or HI, will be requested at your arrival. Upon arrival, guests over 30 years old must show the Hostelling International card. Guests who do not have such a card must purchase it at the following link: https://goo.gl/tbDwAC for a supplement of 5 euros if they are under 30 and 10 euros for 30 years or more. It is one of the best locations in the city reported by public transport: From here you can access anywhere via the subway and buses, including a walk you in the city centre or at the beach. Galileo Galilei has a communal kitchen for guests. Kitchen is closed during the summer until the 1st of September.